William Reynolds, after guest appearances in the first two seasons, joined the cast of The FBI in season three as Tom Colby, new sidekick for Inspector Lewis Erskine. Big changes were in store for The FBI in its third season. 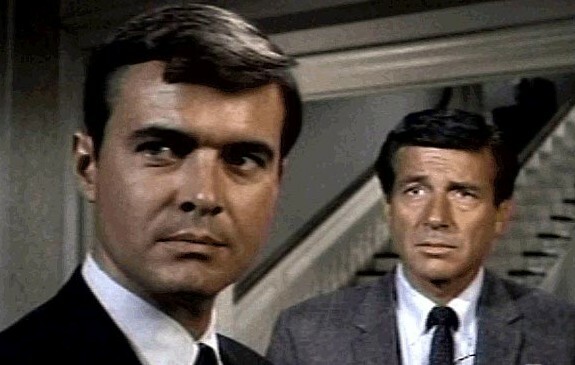 The most obvious was the departure of Stephen Brooks and his character of Special Agent Jim Rhodes. Rhodes joined the same limbo that Barbara Erskine disappeared into in the middle of the first season. Taking his place was William Reynolds, who had played FBI agents in episodes in each of the first two seasons. He took the role of Special Agent Tom Colby, Inspector Lewis Erskine’s new sidekick. No explanation was provided to the audience. As the season begins, Colby is firmly in place. There was also change behind the camera. Associate producer Norman Jolley, who was also a key writer for the series, left early in the season. His only writing credit for the season was for the plot of one episode, which was produced after Jolley left the series. Eventually, Mark Rodgers, the show’s story consultant, was promoted to Jolley’s slot. Regardless, Rodgers was basically the show’s in-house writer. Still at the helm, however, was producer Charles Larson, who constantly tweaked scripts and received occasional writing credits. There were some style changes as well. The main and end titles were shortened. In the main titles, it now says, “A Quinn Martin Production” underneath the show’s title and it would remain that way for the remainder of the series. The end titles, which had run for more than a minute, were cut back sharply. That shortened the arrangement of Bronislau Kaper’s theme and reduced the number of credits shown. This season, the end titles consist of only two shots: Erskine getting into a gold Mustang convertible at the FBI Building (now Department of Justice Building) courtyard, and him driving toward the U.S. Capitol. In the first two seasons, the act of each episode began with the show’s logo inside a silhouette of the Capitol. Starting this season, the logo would appear inside a silhouette of the bureau’s seal. Also, at the end of the pre-titles sequence, when we’re told the name of the criminal and his crime, the case number has been eliminated. A QM Production In Association With Warner Bros. Pictures Inc. The season gets off to a swift start as the FBI’s war on La Cosa Nostra continues. Paul Nichols (Larry Gates), a member of Cosa Nostra’s High Commission, kills Frank Denton and takes the “black book,” the codes necesssary to make a network of gambling operations work. Nichols is on his way to Nevada to participate in a high-stakes poker game. Erskine enlists the aid of professor gambler Doc Cameron (James Daly), who’s been invited to the same game. The inspector goes undercover as Cameron’s financial backer. The idea is for Erskine to observe Nichols using the black book, making him a witness against Nichols in court. The title refers to the gold card that ensures Cameron’s admission to the game. The High Commission, meanwhile, has its own ideas about to deal with Nichols. Commission members decide to have Nichols — and everyone else at the poker game — killed and take back the black book. For Erskine, there’s another complication. A waitress at the resort where the game is being held was married to a man the FBI man put away. The story is tense throughout. You really feel Erskine is in constant peril while undercover. Gates is a convincing heavy and Daly a suitably sympathetic character. As usual in the series, La Cosa Nostra is depicted as an non-ethnic group. It is interesting, though, the High Commission members come up with their plan during a meal. Act I is short, ending with the High Commission meeting. L.Q. Jones appears as one of the thugs hired to make the hit at the poker game. Gunplay: Nichols kills an underling with two shots in the pre-titles. In Act IV, there’s a lot of gunfire. One of the gunmen hired by the Cosa Nostra shoot a couple of sheriff’s deputies outside where the poker game is being played. L.Q. Jones’ character wounds an FBI man with a machine gun, but Colby gets the drop on him. The lead gunman goes into the room where the poker game is being played, firing a machine gun. Erskine nails him with two shots. The FBI has been after a Communist spy only known as Alexander for years. The bureau gets a break when Carl Jordan, a courier attempting to smuggle a tape, is wounded and captured at John F. Kennedy Airport in New York. In what is by now almost a standard ploy, Erskine goes undercover, taking the courier’s place. His disguise is very similar to The Spy-Master in season one. He dons glasses and a fake mustache and speaks in his “Dandy Jim Buckley/Alfred the Butler” (characters he played on Maverick and in Batman cartoons) voice. Erskine travels to what’s supposed to be Springfield, Illinois. Part of the story was filmed outside the “Batman Mansion” in Pasadena, California, which was the exterior of Wayne Manor in the 1966-68 Batman series. Still, several things elevate the story. The guest cast, including Kevin McCarthy, Jessica Walter and William Smithers, is quite good. McCarthy’s Alexander is a man caught in a vise — not only is the U.S. after him, but there’s a power play going on between the Soviet Union and China for control of Communist operatives in the United States. It turns out Jordan was actually sent to kill Alexander, greatly complicating Erskine’s task. Gunplay: The courier that Erskine impersonates gets wounded during a shootout at JFK Airport in the pre-titles sequence. In Act IV, Alexander’s girlfriend (Jessica Walters) shoots a thug (Skip Ward) three times, but the thug survives. Later, William Smithers’ character shoots her once. Erskine nails Smithers’ character with a single shot. Smithers’ character doesn’t survive, we’re told in the epilogue. Also elevating the episode is the score by Richard LaSalle, which definitely channels Bernard Herrmann. As a result, the proceedings have a Hitchcock feel, especially in the climax in Act IV. This would be the only score LaSalle would do for the series, though snippets of his music would show up in later episodes. GRADE: A.
Here’s a preview of the episode that Warner Archive uploaded to YouTube. It includes the very end of Act II and the start of Act III. Erskine and Colby investigate possible jury tampering. A federal game warden was killed and George Owens (R.G. Armstrong) is determined to get his son, accused of the crime, off. Owens thought he had one juror bought off. But when the man has second thoughts, a brief struggle ensues and the juror dies in a fall. Owens, though, is still determined. He has his other son try to intimidate another juror by threatening his wife. A routine episode, a bit of a let down after the two strong episodes that led off the season. There’s also some lack of attention to detail. The case is being prosecuted by a U.S. attorney. But the trial takes place at a county courthouse. Also, murder trials are usually tried in state courts. The episode’s stock score is mostly made up of music by Richard Markowitz and Richard LaSalle from the first two episodes this season. GRADE: C-Plus. Erskine and Colby tackle an espionage case that extends back decades. It begins when a Communist agent is killed at a baseball game in New York. He has been eliminated because his replacement is arriving in New York — Steven Ramsey, president of the McCann corporation who is really a deep-cover agent. Ramsey is president of McCann “in name only,” according to Marvin Miller’s narration at the start of Act I. The real brains of the operation is Ramsey’s supposed administrative assistant, Louise Freed (Delphi Lawrence). It’s not specified which Communist nation Louise and Ramsey work for, but it’s probably East Germany. They occasionally call he other “liebchen,” though Ramsey clearly is being sarcastic. Before World War II broke out, Steven Ramsey, his brother Alex (Richard Anderson) and Alex’s future wife Rosemary (Phyllis Thaxter) were in Germany. Alex and Rosemary thought they were feeding false information to a Nazi. But Steven Ramsey provided actual data. He went to work for McCann after the war — and was blackmailed into working for the Communists who had records of the Nazi spy activity. Now, Louise is forcing Steven Ramsey to seek U.S. rocket fuel information from his brother, a top research scientist. Louise is totally ruthless. She has Alex Ramsey killed (the assassin also killed the agent at the baseball game). Steven Ramsey goes along with it. When Alex is killed, the plan is to make him look like the traitor. Erskine isn’t buying it and pressures Steven Ramsey. After the FBI man leaves, Steven Ramsey begins to cry. Erskine questions Rosemary Ramsey, who now knows Steven Ramsey is a traitor. Time is running out. Louise Freed has been recalled and is headed to the airport. Steven Ramsey drops her office. The same assassin who killed Alex is going to do the same to Steven. But the FBI is there in force, eventually rounding up all the spies. Steven Ramsey and Louis Freed, we’re told in the end narration, were convicted of espionage. The assassin was convicted of Alex Ramsey’s murder and executed. The plot is detailed and requires viewer attention. The episode has a good cast. Delphi Lawrence’s Louise is a particularly nasty villain. When Erskine arrests her at the airport in the epilogue, she refers to the FBI as “gestapo,” causing the FBI man to flinch ever so slightly. He returns the insult by being polite. On the Warner Archive DVDs, this is one of the few episodes to retain the Ford Motor Co. logo in the main titles. Sidney Cutner provides an original score. GRADE: B-Plus. One of the highlights of the season. The two-part story combines elements of both a kidnapping drama and a caper. Max Griswold (Arthur Hill), on the run from the authorities for more than six years, has been leading the life of a quiet real estate agent in Los Angeles. David Spiers (William Windom), who once did time with Griswold in Leavenworth, shows up, wanting Griswold to plan out a robbery that will net between $3 million and $4 million. Griswold, not wanting to upset the life he’s established for himself, refuses. Spiers, however, isn’t the type to accept no for an answer. In Kansas City, Griswold’s 18-year-old son is kidnapped. Spiers now has the leverage he needs — either Griswold plans the job or Spiers’ men will cut the son’s throat. Meanwhile, the kidnapping has drawn Erskine’s attention and he asks Arthur Ward to put him on the case. Erskine had worked a previous case that resulted in Griswold fleeing the law. Working leads, including a janitor who witnessed the kidnapping, Erskine and Colby turn up one of the kidnappers. But while the FBI has the man under surveillance, he shoots a policeman. The bureau agents give chase and a shootout occurs. Erskine’s shooting is too good and the suspect is killed. Griswold is busy assembling a team for the robbery. The target is Hill-Dempsey, a foreign exchange broker. Griswold rents a building with similar dimensions to Hill-Dempsey. The robbery team also has bribed a janitor at Hill-Dempsey, who provides the information needed so the robbers can practice the job. As Part I ends, a major complication arises. Hill-Dempsey has a contract with a security vendor that keeps the vault under constant watch by closed-circuit television. If there’s even the slight sign of a robbery, or if the picture is cut off, the security company will send armed men within seven minutes. As Part II begins, the stakes get even bigger. Part of Griswold’s plan involved obtaining a truck. The gang steals one and kills the driver. Erskine continues his methodical investigation. Mrs. Griswold, who’s still in love with her husband, finally provides the FBI inspector with enough information to propel the probe forward. Griswold, in the meantime, comes up with an idea to make the robbery work. The gang will break into the Hill-Dempsey circuit, record 30 minutes of surveillance camera time before the crime takes place. When the robbery takes place, they’ll cut the circuit and instead play their recording for the security company. The FBI keeps following what’s becoming a pretty bloody trail. Spiers hires a hit man to kill the stripper girlfriend of one of the robbery team, figuring she’s too big a risk. Erskine and Colby arrive just as she’s being stabbed. As the hitman tries to flee, Erskine nails him with one shot. The stripper, with her dying breath, provides additional leads. Eventually, Erskine and Colby split up, with the inspector pursuing the robbery angle while Colby leads agents to free the son. Griswold, Spiers & Co. do manage to rob the vault. The janitor who provided inside information, though, wants to accompany the gang in their escape. The delay, slight at it was, allows Erskine to catch a glimpse of Griswold and Spiers getting away by boat. Erskine soon after joins up with the Coast Guard to chase down the boat. Spiers, so close to success, tries to attack a Coast Guard cutter with a large gun on the getaway boat. He’s shot up. The gang surrenders. As Griswold gives a statement, he’s briefly reunited with his wife and son at the office of LA SAC Bryan Durant. Very well acted. Arthur Hill’s Griswold is conflicted but proceeds with the caper to save his son. William Windom seems to be enjoying himself as the quirky, yet cold-blooded, Spiers. For the third time in as many seasons, Louise Latham and David Macklin play mother and son. Writer E. Arthur Kean specialized in complicated plots and does so again here. When Efrem Zimbalist Jr. interviews Mrs. Griswold, we get bits of Compassionate Erskine, Tough Love Erskine and Stubborn Erskine. Trivia: This story has a pretty high body count. We know one of the kidnappers, the truck driver, the stripper and Spiers all died. In addition, the robbers also shoot a Hill-Dempsey guard but we’re not told in the end narration whether he died or not. We’re also not told for sure whether the hit man Erskine shot died, though judging by the way he fell, it appears he’s not getting up. When Erskine and Colby first meet with Durant in his office, the LA SAC says, “You must be Tom Colby.” It’s one of the few acknowledgements in the season so far that Erskine has a new partner. Douglas Henderson, who played Durant in Season One before yielding to Dean Harens in Season Two, shows up in Part II as the San Diego SAC. Here are the main and end titles to Part II, including the Ford Motor Co. logo in the main titles. When a State Department employee is bludgeoned to death in his Washington apartment, you know it’s a big case. That’s the kind the bureau has to assign to Erskine. An agent for a Communist nation kills the employee, who knows a general who’s about to defect. While the murder takes place in the State Department official’s apartment, the body was dumped in a Washington park to make it look like a mugging. The FBI is called in and almost immediately Erskine suspects all is not what it appears. Specifically, the killer (Frank Marth) wore thick glasses and pretended to have a broken arm. While the murder was successful, the killer’s thick glasses were broken and there are fragments of the cast in the dead man’s apartment. Erskine and Colby follow up leads. It turns out General Salzman from a Communist bloc nation is preparing to defect. He has already sent his wife to America, where the State Department employee was to meet her. A Communist spy ring already is acting to stop it. Besides killing the State Department employee, a sleeper agent (John Van Dreelen) has been activated. The sleeper, who supposedly defected six years earlier, knows the general and his wife and won’t immediately draw their suspicion. Eventually, the wife falls into the hands of the Communist spies to force General Salzman to end his defection. The bureau, led by Erskine, has to save her within hours or else General Salzman will return to his own country. The story is told simply but effectively. Van Dreelen normally played mastermind villains. Here, he’s a more lowly type who’s being forced to participate. By this time, the sleeper has a wife and a 14-year-old adopted son. The mastermind in the episode is played by Dana Wynter, who usually played more sympathetic roles. She does fine as “Mata Hari in spades” as Colby refers to her character. One minor demerit: for a series that normally paid the extra money to have real helicopters, the FBI chopper in Act IV clearly is a miniature. Trivia: Pat Cardi, who played Jack Klugman’s adopted son way back in episode 2, portrays Van Dreelen’s adopted son here. He had gotten taller and his voice had become considerably deeper, in the interim. The stock score includes music by Richard Markowitz originally composed for Season Two. GRADE: A.
Scott Marlowe makes the first of two appearances this season as Charles Nyack, a boxer convicted of assaulting a girlfriend (Diana Hyland). Nyack has just gotten out of prison on parole but wants to get even. Nyack accidently kills a friend who’s picked him up from prison (Nyack punched him out, causing a severe head injury to the friend). Erskine and Colby, having wrapped up another case, are heading to an East Coast airport where Nyack is headed. However, a blackout affecting four states gives Nyack the chance to get away. Now, the bureau begins a manhunt before Nyack can reach his target. The blackout complicates the FBI’s efforts. Meanwhile, Nyack methodically pursues his target. You know he means business because he’s carrying an ax he’s come across. Erskine, after an intense hand-to-hand fight with Nyack, nails the boxer with a single, right-handed shot. Nyack recovers from the wound and is convicted for murder. This is the last appearance by actress Amy Fields as Arthur Ward’s secretary, Jean, who appeared in the earliest episodes of the series. There’s also a 77 Sunset Strip reunion with Byron Keith as an airport police detective. In Los Angeles, the FBI conducts a stakeout for two members of La Cosa Nostra. One, William Judson, is wounded in a shootout and dies later. The other, Richard Macklin, carjacked a nurse (Lynda Day) and is still at large. As it turns out, Judson was killed by a stray shot from Macklin, not by the FBI men. Regardless, the bureau needs to capture Macklin alive to obtain key information about La Cosa Nostra activities in Miami. One of the better espionage stories of the season. Karl Reiman (Alf Kjellin) supposedly is a Washington-based journalist but he’re really an agent for an unspecified Communist agent. He’s trying to seduce Julie Kipp (Antoinette Bower), who types up coded sensitive reports for an important U.S. agency. Reiman’s superiors want details of a report about how the U.S. would respond if war broke out between the Soviet Union and Red China. There’s a complication when Reiman’s estranged wife shows up in Washington. The crafty Col. Federic Maas, an embassy official who runs espionage operations, had Major Paul Bohler kill the wife. The murder, initially seen as routine, brings the bureau into the case. Erskine decides to rattle the embassy. Maas is called into Erskine’s office and the two play a game of verbal cat and mouse. Meanwhile, Maas is pressuring Reiman to get results now because an important peace conference is about to begin in Toronto. Julie at first refuses Reiman’s request for the information. However, she’s in love with him and gives in, providing Reiman with a typewriter ribbon that will provide his government with all it needs to know. At the same time, Erskine and the FBI’s pressuring of the spies begins to yield results. Julie also confesses her involvement. Bohler and Reiman have a final confrontation at Dulles airport just before Erskine arrives. Actor-director Kjellin is quite good here, coming across as a genuinely burned out spy who has fallen in love with his targeted assignment. This episode also reunited Bower with director William Hale. Her character here is similar to the lonely, spinsterish woman she played in a Hale-directed Season Two episode. This episode also establishes that Erskine is fluent in German, a talent that will come in handy in Season Four. An OK episode with a good cast. Lynn Hallett (Carol Lynley) has been implicated in a bank robbery because of eye witness testimony. She really wasn’t involved but she panics, fleeing with a boyfriend (Peter Duel). The boyfriend has his own idea for a robbery, giving Lynn second thoughts. Erskine and Colby track the real robbers while trying to catch up to Lynn before it’s too late. The supporting cast includes the ever-dependable Victor French. Erskine nails French’s character with a single right-handed shot. The episode has a stock score. GRADE: B. The weakest episode of the season and one of the worst of the series. This was one of the first — if not the first — episodes produced this season. Two hints: Erskine introduces Colby as “my new associate” to a visiting FBI man in Act I. Meanwhile, the end titles include associate producer Norman Jolley, who departed the show early this season. It’s understandable that ABC decided to wait until mid-season to broadcast the episode. John Rim (Tom Skerritt) has escaped from federal prison from a southern state (not specified) full of “swamp people” (Rim’s home turf) and “hill people.” Rim kills a “hill” person in the pre-titles sequence to avoid getting captured. Meanwhile, Rim’s wife (Katherine Justice) Rim’s brother (Wayne Rogers). When Rim shows up, things naturally get complicated. The performances here are about as subtle as the 1959 film version of Lil’ Abner, but that was intended to be a comedy. The episode isn’t a total loss. The QM gravitas prevents things from sinking too far. Also, Efrem Zimbalist Jr.’s Erskine is as earnest as always, a pillar of consistency. Still, this is definitely a letdown after some of the stories that led off this season. Meanwhile, there’s stock footage of a helicopter flying over a wooded area (probably from a Warner Bros. movie). In Act III, Colby tails Rim’s wife through the swamp, but gets bit by a snake (more stock footage involving the snake). In Act IV, Erskine wounds Rim with a single shot, but the inspector falls into a pool of quicksand. Yet, in the epilogue, Erskine shows no signs of ever being in quicksand. Also, Erskine has *the same outfit*. The original score by Sidney Cutner is good. It very much fits the Bronislau Kaper template of early episodes. The score is one of the best aspects of the episode. GRADE: C-Minus. One of the best episodes of the season. John Graham, son of a retired industrialist, is kidnapped near Chicago. The crime is discovered when John Graham’s convertible sports car is found stripped on a back road. The Grahams have a complicated dynamic. Philip Graham (Russell Johnson), the oldest son, had split with his father and went into business on his own. John, the youngest brother, had taken command of the family business. Meanwhile, the father suffers a serious stroke while flying home from Europe. As a result, the estranged Philip must deal with the situation for the family. There’s a family dynamic with the kidnappers as well. Walter Gretzler (Edward Asner) is the uncle of Norm (Martin Sheen). Walt isn’t educated but dangerous and more than willing to kill John Graham if necessary. For entertainment, he reads a Superboy comic book. Norm is more educated but immature. There’s a hint of Tough Love Erskine. Philip Graham is anxious and almost wants the FBI inspector to make the decision how to proceed. Erskine tells him he can’t make up his mind for him. The bureau will do what it takes to capture the kidnappers but the decision whether to pay the ransom is up to him. Philip opts not to pay, believing that paying the ransom won’t guarantee John’s safe return. Russell Johnson today is known either for playing the Professor on Gilligan’s Island or criminals on series such as the Adventures of Superman or Mannix. Here, he’s very good. Some of his best scenes are where he’s talking to his estranged father (Ian Wolfe), laying mostly paralyzed in a hospital bed. Wolfe, meanwhile, shows you can have no lines but can still act with nothing but your eye movements and (at the very end) a hand gesture. Producer Charles Larson, who wrote the script, does a good job of fleshing out both the Grahams and Gretzlers and giving the actors involved something to work with. In the climax in Act IV, Erskine nails Walt with a single right-hand shot. We’re told in the epilogue that Walt didn’t survive the wound, while Norm ended up with a life sentence. The ending is particularly satisfying. Marshall and Philip reconcile, as the father suggests (with great difficulty and with only a hand gesture) that the oldest son manage his affairs while he recovers from his stroke. Erskine observes the scene. He acts as a surrogate for the audience when Colby asks how things are going. “They’re fine,” Erskine says as he and Colby leave to return to Washington. The score is by John Elizalde, who would become the show’s music supervisor in later seasons. Elizalde’s score essentially follows the Bronislau Kaper template of the first half of the series. GRADE: A. In Los Angeles, a Communist spy ring is trying to obtain plans for a missile project from a defense contractor. The ring has an inside man — a draftsman whose fiancee was imprisoned in East Germany. When he finds out she’s dead, the employee confronts Major Jan Anka (Michael Rennie), who is using the identity of Albert Robinson, an American who has been dead for years. Anka kills the draftsman. He can afford to because Anka has planted another operative at the defense contractor. Erskine and Colby are already on the case and arrest a courier for the spy ring. When the draftsman turns up dead, the FBI’s investigation intensifies. Meanwhile, things get more complicated. The daughter of real Albert Robertson turns up, looking for her father and has found Anka. Her life is now in danger as Anka and the spy ring move to protect themselves. What makes this episode is the cast. Rennie’s Anka comes across as burned out, having been a spy for too long but still having to complete his current assignment. Anka has a severe ulcer. When the daughter (Julie Sommars) turns up, he comes across as genuinely upset and conflicted. Anka also has no real family. His only companion is his dog, Sean. Efrem Zimbalist Jr. has a good moment in Act III as he informs the daughter her father is really dead. It’s not something Erskine relishes doing but it has to be done. There’s less gunplay than other episodes this season. At one point, Erskine draws when he thinks a member of the spy ring is going to shoot. Instead, the spy commits suicide with cyanide. In Act IV, Anka’s superior (Harold Gould), shoots at the inspector. Erskine nails him with a single, two-handed shot. But we’re told that Gould’s character survived and was convicted of espionage along with Anka in the end narration. This episode is a perfect example of the QM gravitas at work. On other series, this could have deteriorated into melodrama. But, at QM, things stay on the straight and narrow. It might not be the best late 1960s television had to offer but it holds your interest and doesn’t become farce. Army soldiers discover a skeleton during training in California. The dead man was a Marine who was believed to have deserted in the late 1950s. Around the same time, a retired hitman for the Cosa Nostra is killed. Of course, both events are related, with Erskine and Colby trying to tie both together. Reynolds, whose character is now based in the Midwest, travels to San Diego (where his ex-wife now lives and has a book store). He needs to know if her son is his child. As soon as Duquesne sees the boy, he knows he’s the father. Reynolds does a good job in the scene and it’s one of the highlights of the episode. There’s also an amusing scene in Act III, where Erskine and Colby question a potential witness (Roy Engel). It’s not exactly played for laughs but it is a quirky scene that stands out. Gunplay: Erskine nails a Cosa Nostra hitman (Johnny Seven) with a single right-handed shot in the climatic sequence of Act IV. The stock score is mostly Richard Markowitz music from Episodes 66-67, with some snippets of John Elizalde’s score from Episode 74. GRADE: B-Plus. An OK story, with the QM Gravitas preventing things from sinking too low. Camp Newstart in Illinois is a place for young people to get a fresh start. Robert Drivas plays another tightly wound character, except here’s he’s sympathetic. He got too fresh seeking a date from a waitress at a bar in the nearest town. He was thrown by the bar owner. Another man, William Porter (Lou Frizzell), swoops in and ends up killing her on U.S. government-owned land. That brings the FBI into the case. There’s also a heat wave in progress, which is making the situation more tense. The story is a basic procedural tale as Erskine and Colby work the clues that lead to Porter’s arrest. There is an attempt to round out many of the characters. Act IV, where a group of townspeople try to take law into their own hands at Camp Newstart seems a little drawn out. The episode has an original score by Sidney Cutner. GRADE: C-Plus. Another OK episode. John Clanton (Tom Bosley) owns a chain of garages and a race team. About a year earlier, he was refinanced by Ben Heath (Michael Tolan), who appears to be a respectable businessman but who, in reality, is a criminal. One of Clanton’s race drivers is ready to walk and spill the beans. A killer in Heath’s employ who works on the race team shoots out the driver’s tires during a practice run. The car crashes and the driver is killed. Another team driver, Bill Dean (Michael Callan), was a friend of the dead driver. He’s now thinking about quitting as well. Erskine goes undercover as a team owner while Colby is undercover as a race driver. We’re told that Colby formerly race “midgets,” a type of race car. The garage/race team operation now is deeply involved in stealing and re-selling stolen vehicles. The racing sequences seem to be a mix of stock footage and second unit work directed by Carl Barth. A shot of an exterior of a hotel is recycled from The Gold Card. The stock score includes music by Richard Markowitz and John Elizalde. GRADE: C.
This espionage episode provides some background about Assistant Director Arthur Ward. We’re told his first assignment for the bureau was in Seattle when he was 26. Fifteen years earlier, Ward was in charge of the espionage desk in New York. At that time, the FBI broke up a spy ring, but defecting scientist John Streyer (Richard Kiley) got away. Now, Streyer has returned to his native country. Both Communist agents and the bureau are after Streyer. At the start of Act I, we see that Erskine, Colby and Ward are all in New York. Erskine is testifying in a federal court case while Ward is getting ready to fly to the West Coast to give some speeches. When they learn that Streyer is back in the country, Ward is itching to get involved. Without initially consulting his boss, Erskine gets Ward on a later flight to give the assistant director several hours’ time to work on the case. Also of note: the New York office has a new SAC, Gary Morgan, played by John Kerr, who portrayed the Chicago SAC in episode 74. Richard Kiley provides a powerhouse performance, and draws the viewer’s attention in every scene he’s in. Streyer is increasingly desperate as he’s caught in the squeeze between East and West. Streyer doesn’t know who to trust and, most of the time, with good reason. Curtis Stone has an invalid wife. To pay for operations she’s had, Stone has been extorting the wives of service men, threatening to tell false stories to their husbands. His latest extortion has backfired. The woman was so distraught, she falls off her terrace to her death. She was married to Sgt. Devin (John Ericson), who’s determined to make the extortionist pay. The question is whether who’ll get to Stone first, Devin or the FBI, led by Erskine and Colby. Another example of how the QM Gravitas keeps the story on the straight and narrow. This episode had the potential to become a soap opera but avoids doing so. Meanwhile, Stone (Roy Poole) isn’t a stereotype. He’s obviously doing something very bad but we’re shown why he’s resorted to extortion. On the other hand, there’s also a missed opportunity. Erskine tells Devlin he’s understands what the sergeant is going through. Given the fact Erskine is a widower, he should. But the inspector never mentions this. Clearly, once the decision was made to jettison Barbara Erskine in season one, QM decided never to bring up Erskine’s back story again. The writing credit indicates Gerald Sanford rewrote David W. Rintels. In Act I, we see Stone drive to his house in Brooklyn, but at the start off the shot there’s a rock formation you wouldn’t find in the New York borough. John Kerr is back as the SAC of the New York FBI office, but a different shot of the New York Federal Building exterior is used compared with the previous episode. Finally, this is one of the few episodes where Erskine doesn’t touch his gun, much less fire it. The episode has a stock score. GRADE: B. A trio of men conduct a robbery at a party at an Arizona ranch attended by rich people. It becomes a kidnapping when things go awry. A guest stabs one of the kidnappers. The guest is shot and apparently killed ( we’re told murder is one of the charges at the end of the pre-titles sequence, but the guest’s fate is never stated). So, the kidnappers take Katherine Daly (Anne Baxter), the hostess of the party. Things continue to go badly. The stabbed kidnapper eventually dies. He had hidden a plane in the desert so the criminals could fly to Mexico. As part the plan, and to create a diversion, the third kidnapper, Anthony Chandler (Skip Ward), has gone to Los Angeles. So now, Frank Padgett (Steve Ihnat), who planned the robbery, is alone with Katherine. She grew up in the desert. Padgett tells Katherine he’ll let her live if she guides him to the aircraft. Erskine and Colby lead the bureau’s investigation. Erskine, after no gunplay in the previous episode, wounds Chandler with a single shot in Los Angeles. Back in the desert, Katherine almost gets away from Padgett. But she had ditched her shoes and was running in her stocking feet. The criminal was able to track her from cuts to her feet. Erskine devises a desperate plan. The FBI knows from the arrested Chandler that Padgett has a radio. The inspector convinces Katherine’s husband to give a radio interview. He’ll give out information that means nothing to Padgett but will hopefully get Katherine to lead the kidnapper to FBI men. Erskine, after three shots, wounds Padgett in the knee and Katherine is rescued. Steve Ihnat was a go-to actor for casting directors of 1960s and ’70s television shows, including The FBI, needing villains. He’s his usual watchable, intense self. Anne Baxter was often theatrical in her performances (her “Moses! Oh, Moses!” in The Ten Commandments set the bar) and that’s true here. In a scene just before Padgett catches up to Katherine, we can see Baxter was actually wearing some kind of flesh-colored shoes when she was supposedly in her stocking feet. QM Productions clearly didn’t mind bring actors back during the same season to play different roles. Mark Roberts, who played an FBI man in Counter-Stroke, returns as a different bureau agent. Skip Ward was also in Counter-Stroke. Of course, Dean Harens as Los Angeles SAC Bryan Durant was almost a semi-regular. The stock score extensively utilizes music by Richard Markowitz from the By Force and Violence two-parter. GRADE: B-Plus. San Francisco banker Lawrence Reynolds (Bradford Dillman) has embezzled $1.8 million and is on the run. His pursuers include the FBI, led by Erskine and Colby, and Mike Burton (John Vernon), a hood out to collect the $100,000 in gambling debts that Reynolds owes. Nothing startling, but the proceedings remain tense throughout. The trail leads to Puerto Rico, from where Reynolds plans to travel to South America after obtaining forged identity papers. Things look bad for Reynolds and his fiancee (Davey Davison) after Burton catches up with him. Luckily, the bureau has been appropriately diligent and is right behind. Erskine nails Burton with a single, right-handed shot. Burton doesn’t survive. Reynolds brakes an arm after a fall while trying to run away as the FBI moves in. Some familiar faces, including Lew Brown as San Francisco SAC Allen Bennett and Ned Romero as a hood. By this point, Bradford Dillman is one of QM’s go-to actors for guest star roles. There is enough action work that Carl Barth directs a second unit. The stock music includes bits going as far back as some first-season epsiodes. GRADE: B.
Paul Thorpe, a messenger, is robbed of bonds he had been carrying for a securities firm. The guard accompanying Thorpe was killed. Thorpe’s uncle, Frank Poland, is a member of La Cosa Nostra. This saves him from being killed by the robbers. However, Thorpe is threatened with death should he talk to the authorities. Once his employer finds out about the La Cosa Nostra connection and the fact he committed a crime as a juvenile, Thorpe is fired. Erskine, meanwhile, is convinced Thorpe is telling all he knows about the robbery. The story takes place in New York and, confusingly, Anthony Eisley’s Chet Randolph is again the SAC after being replaced for a couple of episodes by John Kerr’s Gary Morgan. QM treated The FBI as a series of one-off stories that didn’t emphasize continuity. Even conceding all that, it still seems strange to see the revolving door at the New York office. Bill Zuckert, who was in the cast of The Gold Card at the start of the season, is back here as Frank Poland. The cast also includes a pre-Brady Bunch Barry Williams as well as Dana Elcar as the owner of a gym where boxers train. Again, nothing unusual in the way of story, but it holds the viewer’s interest. During a stakeout, Erskine nails one of the robbers with a single right-handed shot. The episode has a stock score. GRADE: B.
John Conwell’s official title was assistant to the executive producer. His primary responsibility at QM Productions was supervising casting for the company’s shows. This episode demonstrates how if Conwell liked you, you could get additional work at QM. The guest cast includes QM veterans such as Murray Hamilton, Milton Selzer, Wayne Rogers (his second appearance on The FBI this season), Anne Helm, Dabbs Greer, Rodolfo Hoyos Jr. and Valetin de Vargas. The FBI, led by Erskine, makes an arrest related to a 1963 robbery of $2 million. It was thought eight men were involved, but in the course of the arrest the FBI men discover there was a ninth man. The statue of limitations is approaching on the crime is approaching, but the ninth man (Selzer) feels he can’t wait any longer. Needless to say, there will be plenty of double crosses that will occur. This episode also reminds the viewer of two things: 1) You don’t mess with Erskine (he wounds one of the participants in the robbery with a single right-handed shot in the pre-credits sequence) and 2) You really don’t mess with Erskine when he’s in the FBI helicopter. The episode has a stock score, which includes Richard Markowitz music from Season Two. GRADE: B. This episode is the only third-season writing credit for Norman Jolley, who departed as associate producer early in the season. Presumably, Paul Schneider was assigned to rewrite was whatever material Jolley — who had been one of The FBI’s main writers during the first two seasons — left behind. In this story, we have a variation on the idea that someone has been kidnapped without realizing it (at least not initially). The criminal involved is Spencer Lang played by Andrew Prine, who often played heavies in the late ’60s and into the 1970s. The kidnap victim is Gustav Lang, played by teen idol Bobby Sherman. This episode tries to address the generation gap that was emerging at the time, thanks to the Vietnam War and other events in the late ’60s. This is reflected in the clothing worn by Prine and Sherman but not explored in depth. Still, it provides an interesting contrast with the straight-laced FBI men, led by Erskine and Colby. The title refers to a booby trapped alarm clock Lang has devised. If things go wrong, Lang will be blown up. A major complication occurs at the end of Act III when Lang dies of a heart attack (we’re clued into his heart problems earlier in the episode). Now, Erskine leads the FBI’s efforts to track down the kidnap victim before the booby trap can go off. The case is important enough that Assistant Director Arthur Ward goes into the field to supervise the investigation personally. It appears this episode was filmed early in the season (it has a 1967 date in the copyright notice) and held for broadcast later. Lew Brown, who played the San Francisco SAC in the previous episode appears as a different FBI man here. La Cosa Nostra is beginning operation of an illegal gambling ship in the Gulf of Mexico and plans to blackmail the leading gubernatorial candidate, Lane Benton (Linden Chiles) in a prominent Gulf Coast state. The FBI enters the case when an investigator for the office of a state attorney general (specific state not specified) is shot and another narrowly escapes with his life. Erskine goes undercover. The bureau has an informant on the ship. The informant is a member of the ship’s crew whose brother died of a drug overdose and the crew member wants to make the Cosa Nostra pay. Meanwhile, ambitious John Parker (Peter Mark Richman, then just billed Mark Richman) wants a seat on La Cosa Nostra’s High Commission. He wants to show High Commissioner Aaron Reese (Ken Lynch) that his blackmail plan will deliver an entire state to the criminal organization. A tense, effective episode, if you can overlook the WASP version of the Mafia depicted here and throughout the series. Erskine wounds a gun-wielding crew member with a single right-handed shot. Later, he shoots out a light with a left-handed shot. The inspector gets the drop on the captain, who’s smart enough to give up. Footage shot out on the water means that Carl Barth’s second unit gets some work. The stock score relies a lot of Richard Markowitz’s music for The Gold Card. It also includes a snippet from Markowitz’s score for By Force and Violence. GRADE: B-Plus. A caper story that’s elevated by strong performances by the guest cast. Three men escape prison. The group includes Bill Hollis (Edward Binns), a veteran “tunnel man,” who couldn’t give up danger after serving in World War II. The breakout was organized by Raymond Pike (Charles Aidman), who’s been planning a bank job in New York. Pike needs Hollis’ expertise. One of the other escaped prisoners was Eugene Waring (Scott Marlowe), who killed a member of a sheriff’s department after the group got out of prison. His girlfriend Paula (Joanna Moore) helped with the escape. Hollis considers himself an artist, and he believes the tunnel he has constructed to the New York bank vault is his best work ever. Hollis has tunneled within inches of the bank vault. Waring, impatient, wants to complete the job immediately. But he’s killed a portion of the tunnel caves in. Erskine and Colby are leading the FBI’s investigation. There’s a nice scene where Erskine questions the third man involved in the escape (Paul Mantee). Waring had given the police a tip, wanting Manee’s character — described as a psychopath — to be arrested. Erskine talks about the difference between a man and a child (the man will admit the truth to himself). As a result, Erskine gets a lead. Another good scene involves Barbara Moore’s Paula. Pike has told her about Waring’s death. Moore gets to shine as she fills in her back story. In the climax, Erskine, Colby and New York-based FBI agents reach the tunnel just before Pike and Hollis and plant charges to blow open the vault. Pike shoots at Erskine but is one of the lucky few not to be wounded (the inspector manages to sneak up on Pike, getting the drop on him). Hollis takes nitro into the tunnel, determined to finish the job. When it’s clear he can’t, he commits suicide by throwing two vials of nitro against the tunnel wall. As Act IV ends, the camera pans to Pike, whose pained expression demonstrates he knows Hollis is dead. In the epilogue, there’s another nice exchange. Pike talks about how he needed the best — Hollis — and how the whole plan centered on that. PIKE: Billy was the key man in the operation as far as I was concerned. Was he…I mean…did you find him when you cleared out the tunnel? COLBY: Enough in order to establish identification. Chet Randolph, the New York SAC is mentioned but not shown. The stock score uses a lot of Richard Markowitz’s music from By Force and Violence (another caper story). GRADE: A.
John Whiting (Fritz Weaver) engages in espionage. He sells information to the Communist bloc to generate extra income to support his a high living. His M.O. is to ensnare executives of defense contractors with women and blackmail them to cooperate. His latest endeavor goes bad when Hugh Zimmerman (Barry Atwater), Whiting’s blackmail victim and owner of a major contractor, changes his mind and refuses to go along. A fight breaks out. Zimmerman falls out an open window (the shot of Zimmerman falling is recycled from Season Two’s The Camel’s Nose). Before the fight, Whiting learns that Zimmerman lost out to a rival defense company for Project Hunter, a major initiative. With Zimmerman’s death, the FBI is on the case. Erskine and Colby head to the West Coast. Zimmerman died in San Francisco, while his company is based in Southern California. Whiting, in the meantime, is setting up his new target, Ken Haney (a mustached Norman Fell), who works at Norris, the company that won the Project Hunter contract. Julie, Whiting’s girlfriend, seduces Haney, giving Whiting the leverage to blackmail him. Erskine presses on with his investigation. Zimmerman’s widow (Suzanne Pleshette) was accompanied by Charles Fillmore (Richard Anderson) at the funeral. Fillmore says he was a shipmate of Zimmerman during World War II while Mrs. Zimmerman says Fillmore had been a friend “the past five years.” Erskine is determined to find out who’s lying and why. It turns out it was Fillmore. He’s another member of the spy ring. Eventually, the bureau establishes the link between Whiting and Fillmore. As Haney is delivering Project Hunter papers to whiting, FBI agents are observing. A long chase ensues, with Erskine and Colby cornering Whiting on a new freeway ramp under construction. It turns out Haney gave him false plans (the second time in the episode he pulls that trick). In the epilogue we’re told the U.S. Attorney’s office declined prosecution of Haney, while all members of the spy ring were convicted. Another episode where acting flourishes elevate the material. Whiting, as played by Weaver, is quirky and wound pretty tight. He’s particularly good in one scene where he’s on the phone with Fillmore. Whiting looks into a mirror and starts comparing himself to a scene in Frankenstein where the monster sees his reflection for the first time. Lew Brown is back as San Francisco SAC Allen Bennett. Los Angeles SAC Bryan Durant is mentioned but not shown. Presumably, actor Dean Harens had a conflicting job when this episode was produced. Gunplay: Both Erskine and Colby fire at Fillmore. It looks as if Colby’s shot wounds Fillmore, causing him to flop into a swimming pool. The stock score sounds as if it were drawn from multiple episodes, including, once again, some Richard Markowitz music from By Force and Violence. GRADE (despite being a little padded during the Act IV chase): B-Plus.